Convert points to cash bonuses. Low to zero traffic at Stud games. Although not accommodating online poker players residing in the US, Bodog Poker is geared toward new and casual players, with highly customizable and easy-to-use software, and plenty of low buy-in Sit and Gos and multi-table tournaments designed specifically for beginners. The relaxed environment, combined with guaranteed tournaments ranging from $1,000 to $100,000 offer recreational online poker players the fun and excitement of chasing a big win, without the pressure and intimidation of competing against more serious-minded, full-time poker players. Providing numerous incentives to both attract new players and maintain a loyal customer base, Bodog Poker allows online poker players to collect a variety of cash bonuses and other prizes for their patronage. The 100% Bodog Poker welcome bonus awards up to $1000 to first-time depositors, and the loyalty reward system carries the bonuses even further with the Poker Points to Cash feature. Bodog Poker also gives players the enticing opportunity to win prize packages that include seats in major live events. 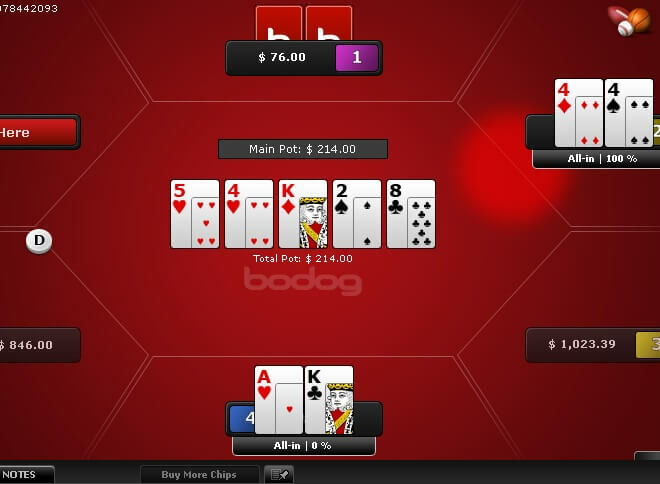 Privately developed with the novice and recreational online poker player in mind, the Bodog Poker software features intuitive navigation controls and a sleek, clutter-free design. Compatible with most modern Windows operating systems, the Bodog Poker software is free to download, and installation is quick and painless. Open to online poker players residing in the US, the traffic at Bodog Poker tends to peak in the evenings, though a satisfying off-peak turn-out throughout the day keeps the most popular games running. The greater bulk of cash game players are focused primarily in the lower stakes of the No Limit Hold’em cash game tables. Pot Limit Omaha, Fixed Limit Hold’em and Pot Limit Omaha Hi-Lo also receive a fair amount of interest from Bodog Poker patrons, even in the slower hours. Running an extensive, round-the-clock tournament schedule, Bodog Poker provides guaranteed tournaments ranging from $1,000 to $100,000 in prize money. Beginner scheduled tournament buy-ins start as low as $4+$0.40, with a guaranteed prize pool of $1,000. Bodog Poker’s beginner Sit and Gos start at $2.20, paying 50% of the players as opposed to the standard Sit and Go payout of 30% of the players. The $100,000 Guaranteed runs every Sunday at 4pm Eastern Time, with qualifiers starting at $1. Bodog Poker also features WSOP Main Event prize packages, the Bodog Poker Open Championship Series – and lower buy-in Contender Series – and the King of the Felt Sit and Go challenge. Players at Bodog Poker will find all of the standard online poker games; Texas Hold’em, Omaha, Omaha Hi-Lo, 7 Card Stud and 7 Card Stud Hi-Lo. 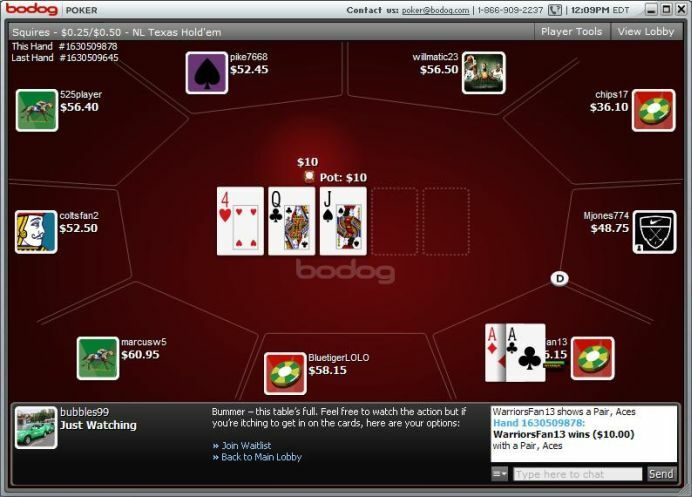 Bodog Poker also makes available to players the less common poker form of 5 Card Stud, however, the 5 Card Stud tables rarely draw much interest from Bodog’s patrons. As one of several online gambling options offered by Bodog, a significant portion of players at Bodog Poker are sports bettors and casino players, resulting in some loose action at many of the low stakes cash games. In addition, catering primarily to the recreational online poker player, Bodog Poker is frequented predominately by inexperienced and casual players. 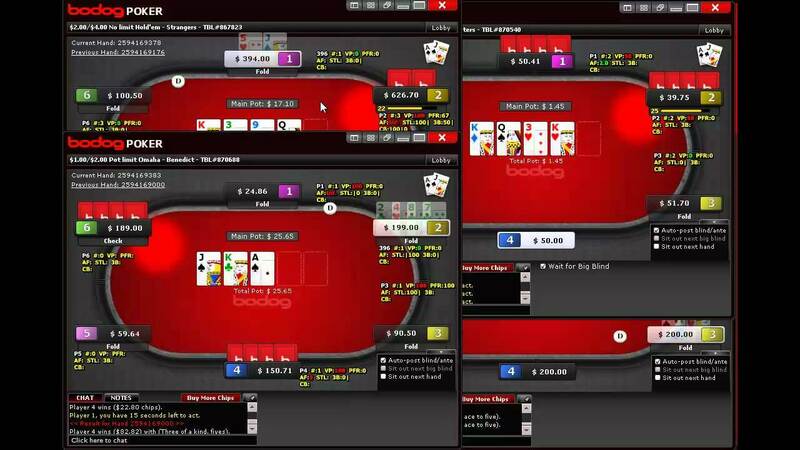 The lack of extensive multi-tabling support at Bodog tends to bore and dissuade experienced grinders and career players, leaving the competition level relatively soft compared to the action at online poker rooms that allow substantially greater numbers of tables to be played at once. First-time depositors at Bodog Poker stand to earn a sign up bonus of up to $1000 with our exclusive 100% Bodog Poker bonus with bonus code: free10. Bodog instantly issues 10% of the sign up bonus for wagering upon processing the player’s first deposit. As the player earns poker points playing real money cash games and tournaments, the Bodog Poker bonus is released in tiered chunks with each poker point milestone achieved. Players are allotted 60 days to clear the entire Bodog Poker bonus. Bodog Poker offers loyalty rewards by turning poker points accumulated in real money online poker games into cash bonuses. 100 Bodog poker points are equivalent to $1 USD, and players my convert up to 25,000 points into cash bonuses within a 30 day period. Poker points are earned by contributing to raked pots in cash games, and by paying tournament entry fees. The minimum number of points that can be exchanged for a cash bonus is 500. Bodog’s standard bonus rollover terms apply to all cash bonuses received by converting poker points to cash. Regular, guaranteed tournaments make up the bulk of Bodog Poker’s ongoing promotions, as well as qualifiers to major live events, and daily $500 freerolls with $1 re-buys and add-ons. Other current and past Bodog promotions include Double Points for players who earn 2000+ poker points in a single month, a rollover-free Bad Beat Bonus of up to $1,000 (100 x big blind) for qualifying losing hands, and a Royal Flush bonus of up to $200. For questions and support not covered in Bodog Poker’s highly detailed Getting Started section of their website, players can call Bodog’s toll free multilingual customer support line 24 hours a day, 7 days a week to speak with a knowledgeable staff member. Assistance is also available via email. Deposits: Visa, MasterCard, eWallet Xpress and check. Cashouts: Visa, MasterCard, eWallet Xpress and check.